This week in my photographic life I’ve got a second subminiature camera, and two (or maybe two more) Pentax K1000s in the hopper. Sadly, I don’t have a whole lot more to report on since I’ve been working on getting stuff ready for the blog from all my photographic adventures last spring and summer. When I have been out with a camera (and I have, don’t worry) I’ve mostly been using the Yashica-Mat, and working my way slowly through test rolls in the Chinon. This is not my first subminiature camera — that was the Whittaker Micro 16 “spy camera” I mentioned in March, 2015. While the Whittaker uses 16mm film (the same as what’s in a 110 film cassette, the Hit camera and its ilk used 17.5mm paper-backed roll film. They were born out the austerity of post-war Japan when every millimeter counted. Speaking of its ilk — there were enough variants on this basic type of camera to make counting them nearly impossible. The Hit wasn’t the first, or even the best, but it was the one whose name became synonymous with the entire class of cameras. They were sold in the back of MAD Magazine and even were available in gumball machines. It may still be possible to buy some kinds of film pre-slit from Goat Hill Camera. They also list spools and backing papers, as well as certain 16mm cassettes and films. And it looks like they are run by the same guy who sells custom-assembled film slitters on Etsy. Incidentally, he’s not far from me. The challenges of developing seem to be overcome adroitly by Mark Hahn, whose fairly ingenious method starts with a 2-liter soda bottle. The images are 14-millimeters square, and the camera itself is ridiculously simple. Most models have a fixed-focus lens, a fixed aperture around f/11, and a single shutter speed (mostly reported around 1/25 second) everset shutter. The genuine Hit cameras were made by the Tougodo company, but they were preceded by the Midget and the Mycro. The Hit was a much simpler, cheaper version of the tiny camera (possibly among the cheapest) that apparently took the American market by storm. No doubt those ads in the backs of MAD and Archie were to blame. The usefulness of the Hit as a tool for making photographs is apparently dubious enough that Koichi Sugiyama’s “Collector’s Guide to Japanese Cameras” reportedly claims that many were purchased for use as Christmas tree ornaments. The minuscule meniscus lens is not known for its sharpness or contrast, and a number of discussions and article mention using a yellow or red filter to improve contrast, with the added benefit of cutting a couple stops of light for outdoor use with the slow shutter speed. Given the difficulty I’m likely to encounter if I want to actually try this out, it’s liable to remain a shelf queen. Then again, I doubt all the collectors out there with hundreds of these little things are using them. Since I use as many of my cameras as I can, I’m not going to feel guilty about that. Conventional wisdom pegs the K1000 as the king of student cameras, though that position has been challenged. Whether it is the best or not, it’s still an easy sell for students and likely to be found in a lot of high school (and college) photography classrooms even today. It’s a rock-solid, all-manual camera with simple open-aperture metering and virtually no features. The only feature it has that it could really do without (assuming the light meter is essential, which most would probably argue it is) is the shutter-ready indicator by the film speed dial. Introduced in 1976, it was built virtually unchanged until 1997. During those 21 years, production shifted from Japan — first to Hong Kong, where the materials and workmanship remained nearly identical, and then to China. 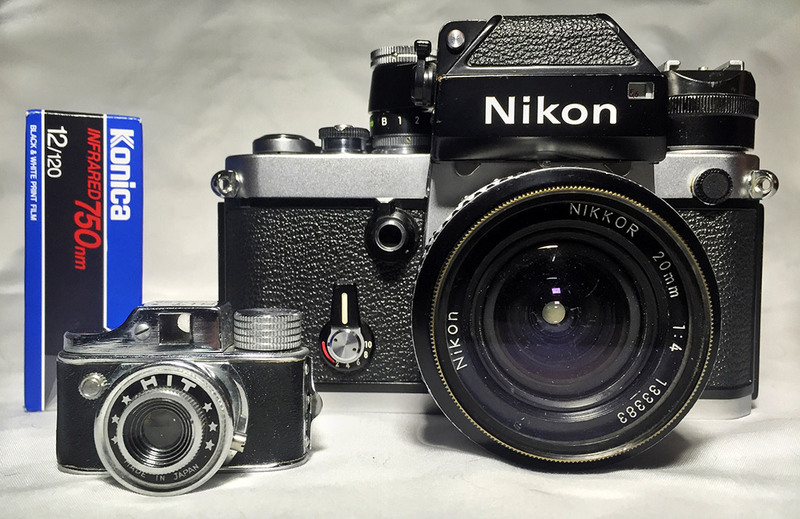 In Chinese-made models, from 1990-1997, plastic replaced many of the metal parts, including the top and bottom covers, the shutter speed selector, and even the rewind shaft. Cast pot metal appears to have replaced some of the machined pieces, too. 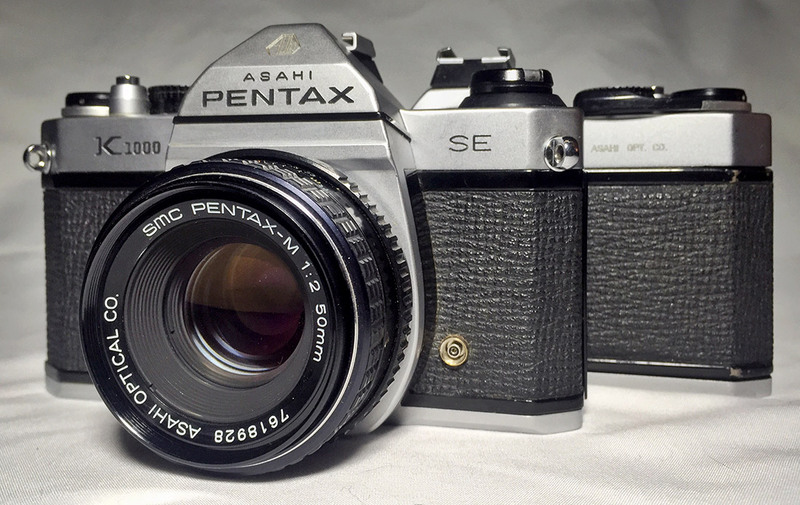 And they even left off the “Asahi” badge on the pentaprism housing. Most sources seem to agree that Chinese-made K1000s aren’t worth their weight in peanut shells. Ideally, look for cameras with the Asahi badge at a minimum, and preferably those marked “Asahi Opt. Co.” on the back of the top cover. Those marked “Asahi Opt. Co. Japan” might be the most desirable. Like the Pentax Spotmatic SP, the K1000 has a bridge circuit and, despite being designed for use with mercury batteries, a modern SR44 battery can be used without worry of inaccuracy. The thing about the K1000 is that I bought two of them this week. Worse, I already have had one. I’m scratching that out because I think I may have given away the one I had. I know I shot a roll of film with it (I have a roll of film in an archive page marked “K1000” — and I remember making the pictures). I just haven’t got a clue where it is now. So I think I gave it away. I found two more for very reasonable prices at thrift stores over the weekend and I bit the bullet. They’re both in good working condition and I want to make sure that, after I review them, they wind up in good homes where they’ll get used. Each K1000 came with an SMC Pentax-M 50mm f/2 lens. One has some rust on the aperture blades, although everything seems to function smoothly. That kind of durability probably is part of the reason the K1000 is often listed as a top all-manual camera. One is an SE model, which differs in two significant ways: it has a horizontal split-image focusing screen with a microprism grid (the standard K1000 has a microprism patch in the center only), and the inside of the film door seems to be coated in a glossier enamel than the older one. Both have serial numbers that appear to be from the late 1970s. So I’ll haul these out with film in them soon enough and give them a try, and eventually you’ll hear about it. 120 Love Day has come and gone and the competition winners and celebration gallery have been posted. I’m pleased as punch to find that my photo of a young woman on 16th Street Mall with star tattoos on her legs was included in the Open Celebration selection. Can’t wait for next year!